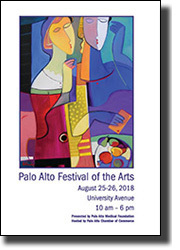 •Palo Alto Chamber of Commerce welcomes you to the 37th Palo Alto Festival of the Arts! PALO ALTO - Recognized as one of the top outdoor fine art festivals in the Bay Area, the 37th Annual Palo Alto Festival of the Arts offers a unique experience to each person. Downtown University Avenue is transformed into a vibrant art gallery featuring original artwork by 300 fine artists on August 25-26 from 10 a.m. - 6 p.m. Hosted by the Palo Alto Chamber of Commerce and presented by the Palo Alto Medical Foundation, this awe-inspiring arts celebration brings together nationally recognized, local, regional and emerging artists, showcasing an array of mediums from contemporary to traditional: kinetic artworks, bronze sculptures, conceptual creations, and more. This artful avenue of design focuses on many one-of-a-kind original artworks for the art collector and festival connoisseur. One of the participating artists, Ali Golkar, is the featured artist of this year’s 37th Annual Palo Alto Festival of the Arts poster artwork. Immerse yourself in the arts, enjoy live entertainment on stage and in the street and be intrigued by artist demonstrations and interactive exhibits. Don’t miss the Italian Street Painting Expo on Tasso, presented by the Palo Alto Weekly. More than sixty Madonnari, or street painters, will use pastels on pavement to create vibrant and colorful, large scale images. Even the Kids-Chalk-A-Lot area located near Lytton Avenue, welcomes the young Madonnari (under 12 years old) to create their own expression of chalk painting for a minimal fee. All proceeds benefit Youth Community Service. Enjoy the sounds of acoustical guitars, ukuleles, and sweet melodies at the Webster Stage and for more high energy entertainment visit the Waverley Stage presented by AIBrain. Or create your own at Chopin & Chandeliers. Anyone who can play the piano won’t want to pass up the opportunity to “tickle the ivories” on the Play Me Piano. Just look for the multi-colored chandeliers on the Tasso plaza. The ever-popular Kids’ Art Studio presented by Ladder, is free to all children. Located on Kipling, professional art instructors will guide children in age appropriate art activities to create memories that will last for years. Experience art at its best and leave with a memento for someone special – you! Public transit and free parking make visiting the free-admission festival easy and convenient for every art aficionado and festival attendee. And, for everyone’s safety, be kind to your pets and leave them at home. Free bike corral located on Emerson and University across from Lytton Plaza. For public transit information: www.511.org. Call (650) 324-3121 or visit www.mlaproductions.com for more information. Palo Alto Chamber of Commerce Welcomes You to the 37th Palo Alto Festival of the Arts! PALO ALTO - Palo Alto, the birth place of Silicon Valley, is one of the nation’s most desirable and exciting places to live and work. With its proximity to Stanford University, deep ties to technology firms, highly rated schools, beautiful public parks, libraries, open space and community centers, Palo Alto serves as a hub for innovation and entrepreneurship, while preserving traditional values of family and neighborhood life. For nearly 110 years, the Palo Alto Chamber has been the singular connection to this exceptional community for visitors and residents alike. Today our 550+ members span the spectrum of 21st century businesses in the mid-Silicon Valley region, from local-serving retailers to global industries. Our members take pride in their civic contributions and sponsorship of community-building events, like this festival, to ensure the vitality of the community as a whole. Special thanks to our festival’s Presenting Sponsor, the Palo Alto Medical Foundation. August 25-26, 10 a.m. to 6 p.m.
Free festival shuttle information and route details: www.mlaproductions.com. PALO ALTO - Is it a bird, a plane, or superman? Don’t look up, look down, or you’ll miss the exciting chalk paintings along Tasso. Each masterpiece is carefully choreographed through numerous hours of painstaking preparation as these artists slowly reveal their artistic creations on the pavement. The anticipation alone brings visitors back both days to watch these talented artists from start to finish, as they use pastels to create images ranging from 4ft. to 12ft. PALO ALTO - What do you get when you combine Frederic Chopin and Dale Chihuly? You get Chopin & Chandeliers! PALO ALTO - Soft melodies serenade you while strolling the festival as you visit with artists from one of our street corner concerts playing guitar, saxophone, accordion, and a Chapman Stick. Also, an acoustical assortment of fabulous talent is located at the Webster Stage with an interactive ukulele jam session open to everyone on Sunday. Or, maybe just let loose and enjoy some dancing with a great lineup at the Waverley Stage. Whatever it is, we have it all! Tom Rigney has become one of the premier blues and roots music violinists in the world, and continues to be a prolific composer of powerfully compelling music for the violin, music whose influences come from an extremely wide range of musical styles within the broad boundaries of American Roots Music. SEZU is the only band around featuring David Kaffinetti also known as keyboardist “Viv Savage” in the cult classic movie “This Is Spinal Tap”. In his “post-Tap” life, David is an integral part of genre-hopping SEZU band, combining jazz, folk-rock and luscious harmonies. Making music that is lovingly crafted and passionately played, this power trio features Randy J. Hutchinson on guitar/vocals, and Kathy Ray on bass/vocals. According to Bazooka (A2B) features catchy songwriting, a vintage feel and three-part harmonies. With accordion, bass, guitar and percussion, A2B’s lively performance draws from rockabilly, country and zydeco with a distinctively California flavor. PALO ALTO - Award winning artist Ali Golkar is an international artist who is known for his dynamic and colorful contemporary style. Born in Iran, his passion for the arts began at an early age with classical Persian style painting, some expressed on the walls of his home when he was only six. After moving to the United States, his current painting style, somewhat reminiscent of Picasso’s, was well-received and exhibited throughout California, where he currently resides. His work has evolved including multiple media: etchings, watercolor, pen and ink, and a limited-edition collection of modern sculptures--the first representation of his signature style in three-dimensional form. "My hand holds the brush, and my heart blows life into it. I can express myself more freely with my paintings," says Golkar. A passionate painter, with a variety of subject matter from figurative to landscape. One of Golkar’s delightful images is featured on this year’s 37th Annual Palo Alto Festival of the Arts poster. To view more of his original paintings, drawings and limited-edition prints, visit www.aligolkar.com. PALO ALTO - Oregon based, Robbie Curnow, a designer and master goldsmith works together with his wife Chantay exceeding the limitations of conventional jewelry making. They explore the potential that geometry and proportion have on creating extraordinary works from ordinary materials. Together they create unique and daring jewelry that is exceptionally beautiful and innovative wearable art. Their work constantly evolves through invention of new techniques, tools, and a custom blending of alloys, including an unconventional use of materials. Cuttlebone techniques are utilized in the very time-consuming casting process. Cuttlebone is found on many shorelines around the world and was used in ancient civilizations for jewelry-making. It is the calcareous internal shell of a cuttlefish and widely used as a nutritional supplement for birds. “Since my designs are based in nature and influenced by ancient civilizations and sacred math, it lends the perfect touch to my jewelry’s overall look and conveys a feeling no other jewelry can give,” says Curnow. Visit www.jewelscurnow.com to view eloquent metal art jewelry that displays both strength and vulnerability. PALO ALTO - Cary Henrie comes from a family of artists. He grew up without TV which allowed him time to hone in on his drawing skills and excel at his craft at an early age. Art has always been his passion, enjoyment and only career. Henrie resides in Bountiful, Utah. As a mixed media metal artist, his artwork has evolved over the years from peaceful fresco-like paintings to his latest contemporary style he calls “Hypermodern”. A process of experimentation which has taken years to develop and perfect. Learning how to adapt to changes in his work as he lives his passion, purpose and profession. This sophisticated metalwork combined with the depth of painting and transparency of glass, buried symbols, designs and letters with a clean modern look, evokes movement and light, rustic yet refined. To view more of his work visit www.instagram.com/cary.henrie.art. PALO ALTO - When they say, don’t play with fire or you may get burned, Jonah Ward takes this to a whole new level and uses the “burn”, as patterns within his artwork. This northern California artist from Willits applies a delicate and dangerous balance of molten glass to create abstract images on wood within a contemporary style. A wide variety of different woods are used all with different grains and textures. The final image becomes a drawing created by hot glass. Seeing this exquisite display of craftsmanship is impressive enough but hearing about the process makes this artwork even more exceptional. And, you may never look at burned wood the same way again. For more information visit www.jonahward.com. PALO ALTO - Erik Jensen is an emerging artist from Salt Lake City, Utah and new to the art festival scene. Even though Jensen was born deaf, it has never stopped him from making art, from just about anything. He’s received numerous awards and a full-ride scholarship to Utah Valley University. Nowadays he uses discarded computer keyboards to create his eye-catching faux painting with a pixelated 3D flair. Hundreds of keys are used to create these stunning works of art. “I started out with just the normal keyboard colors but experimented to find a dying solution to be able to dye my keys to get colors to pop out in my designs. I put together the design, add the title and quote/words, glue and install them in the frame that I make. I am inspired by the idea of pixilation. Living in a technological world, there are pixelations in everything we see, cell phones, TV, pictures, etc. I believe people fall in love with pixelations of things and not the real thing,” said Jensen. When Jensen is not working on his own art he is a high school art and ASL (American Sign Language) teacher. To learn more about this artist and his work visit www.erikjensenart.com.